Dr. Jennifer Murphy grew up outside of Chicago, Illinois. She graduated from Brown University in 1991 with a BS in Neural Sciences. She received her medical degree from Loyola University Stritch School of Medicine where she stayed to complete her internal medicine residency. Dr. Murphy continued her education attending a fellowship in rheumatology at Northwestern Memorial Hospital in Chicago. After her fellowship training ended in 2002, she accepted a position as an Instructor of Medicine in the Division of Rheumatology at Beth Israel Deaconess Hospital in Boston. Dr. Murphy held an academic appointment at Harvard Medical School for four years teaching medical students, residents and rheumatology fellows. 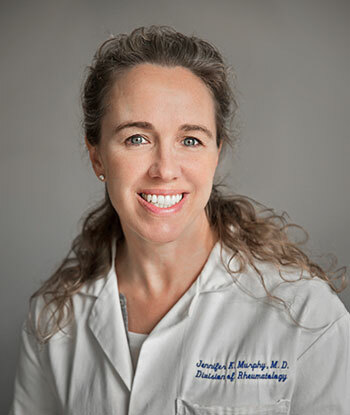 Dr. Murphy moved to Charleston in 2006 as an Assistant Professor of Medicine at the Medical University of South Carolina where she held an academic appointment from 2006-2011. Outside of work she enjoys spending time with her husband and two boys and cooking. Dr. Murphy has been frequently published, and is board certified in Internal Medicine and Rheumatology.